This modern hotel is situated on the east side of Zagreb in the city's new business zone. Although the Hotel Phoenix Zagreb is tailored to meet the needs of business travelers, it is also within reach of many of the city's tourist attractions, including the Zagreb Fairgrounds and many restaurants and entertainment venues. 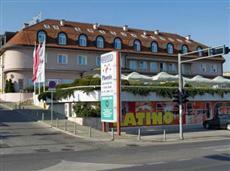 Guests of the Hotel Phoenix Zagreb can park in the hotel's free secured parking lot. Guests can easily get around town using the city's tram system. The rooms of the Hotel Phoenix Zagreb offer elegant surroundings and modern amenities. The hotel offers forty-six traditional rooms and three apartments. Guests of the Hotel Phoenix Zagreb can enjoy the use of many modern amenities, including a free Internet corner, a business room, and a wellness center where guests will find a sauna and fitness equipment. The hotel also offers two restaurants, the Maestro and the Latino Club, and several multifunctional rooms that can hold up to five hundred people for meetings, seminars, and private functions.